We are used to having multiple books open at the same time when looking things up at home or writing an essay for class. Whether PDFs, e-books or old-fashioned paper volumes, switching between books in a smooth movement is something we don’t often think about. This was very different in medieval times. In those days, books tended to resist when you tried to move them: they were heavy as a brick and easily twice that size. A related problem was one of space. The average medieval book has a wingspan of at least half a meter wide when open. Consequently, comfortably placing two books in front of you was a stretch, let alone multiple volumes. In an early-sixteenth-century depiction of Erasmus, the scholar cannot even place a single book on his desk as he is writing a letter (Fig. 1). Interestingly, the challenges of medieval book consultation stands in stark contrast with what we know about reading and studying in the period. Readers browsed through a great number of volumes at the same time, interested as they were in learning different points of view with respect to their topic of inquiry. 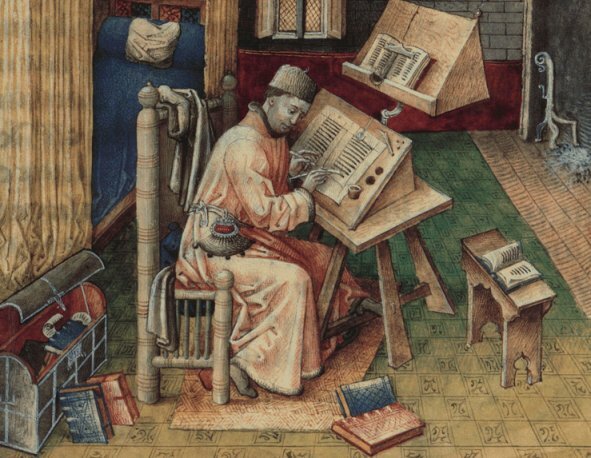 Sparked by this contradiction, this post explores medieval desktops. 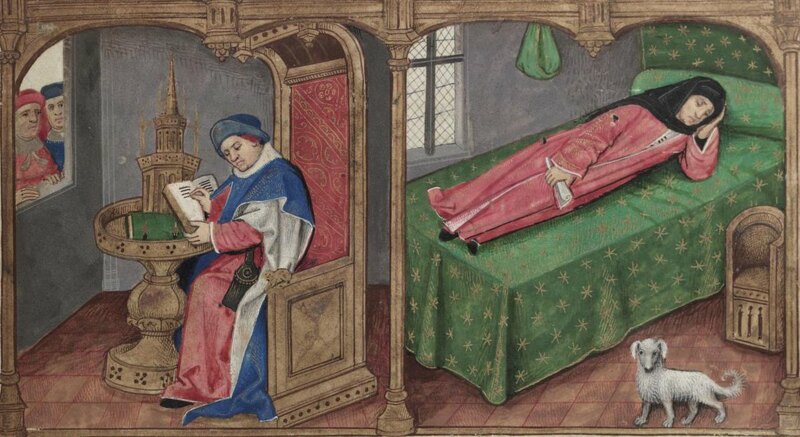 How many books are being consulted at the same time in medieval depictions of reading? How are the objects laid out across the available space? In short, how are we to understand the logistics behind the devouring of knowledge in the last four centuries of the Middle Ages? As will become clear, the answers to these questions vary greatly depending on why an individual handled multiple books at the same time. The first group of individuals who had to manage multiple books were scribes. By definition, a scribe had to have at least two books on his desk: the one he was making (a growing pile of quires, which remained unbound until the very end) and the one he was copying from (called the “exemplar”). While keeping track of the loose quires may have been challenging, of the groups discussed here scribes had it the easiest. After all, the individual was only technically reading one book – the one he was copying from. This explains why their deskspace was of limited size, at least judging from surviving depictions. In most cases their working space was erect rather than flat (Fig. 1). 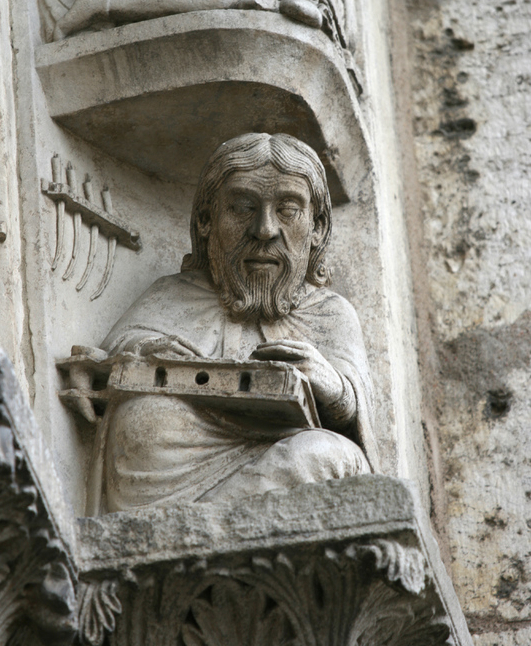 This famous image of Jean Miélot at work shows how the desktop of the scribe had a 45-degree angle, resulting in an almost erect surface. Clearly visible is also a vertical orientation in the line-up of the books: one was placed above the other. In fact, the desktop in this image is split in half, with the lower half containing the book under production, as well as the scribe’s tools (ink pots and pens), while the upper half holds the exemplar. Miélot obviously needed to go shopping for a larger desk, because we see books laying around on the ground and on a bench. While it is easy to find images of scribes with a desk full of books, it is less common to encounter readers in similar situations. That is to say: there are very few medieval scenes in which someone is reading but not writing – where books are present but pens are not. In part, this has to do with medieval study practices. Readers would usually have a pen nearby even when they were just reading. After all, remarks and critiques needed to be added to the margin at the spur of the moment. “Penless” images, while rare, often show a crowded desktop. The scene presented in Fig. 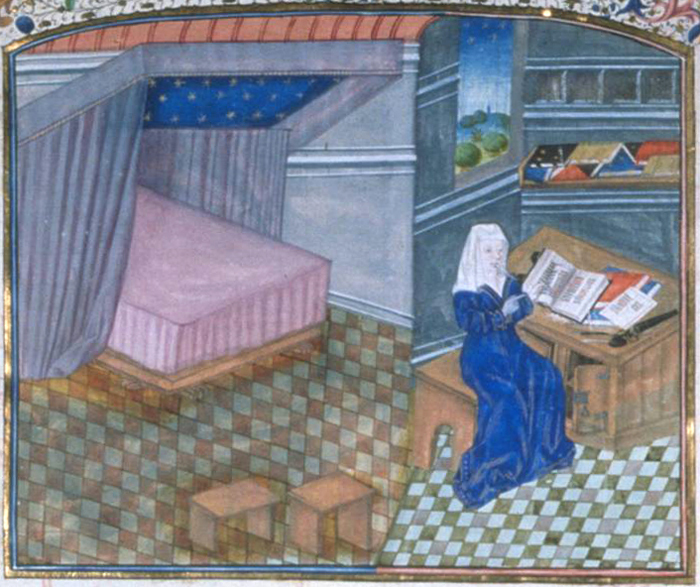 4 shows Christine de Pisan browsing multiple books at a big desk (more about Christine in her study in this article). The absence of the pen may result from an urge to depict Christine as an avid reader. This is emphasized, I think, by the various volumes that lay open – note how some open books are facing down, the way we still do today! From the late medieval period a special tool was available for readers who did not like the clutter shown on Christine’s desk: the book carousel (Figs. 5 and 6). Fig. 6 – Oxford, Bodleian Library, Douce 195 (15th century). These carousels allowed readers to consult multiple manuscripts in a very convenient fashion, by spinning (slowly!) the top part, which moved. The oldest one I could find dates from the fourteenth century (here), but it is possible they were in use even earlier. It is striking that these two scenes show readers – scholars – without pens, even though the second seems to hold an invisible one. Cleverly, the medieval “spinning wheels” in Figs. 5-6 circumvented the constrictions of the limited space a regular desktop provided. However, what if you need even more real estate than the turning desktop could offer? The answer to this question is perhaps one of the most intriguing and cool pieces of book furniture that survive from the past: the book wheel (Fig. 7). Fig. 7 – From “The Diverse and Artifactitious Machines of Captain Agostino Ramelli”, 1588. 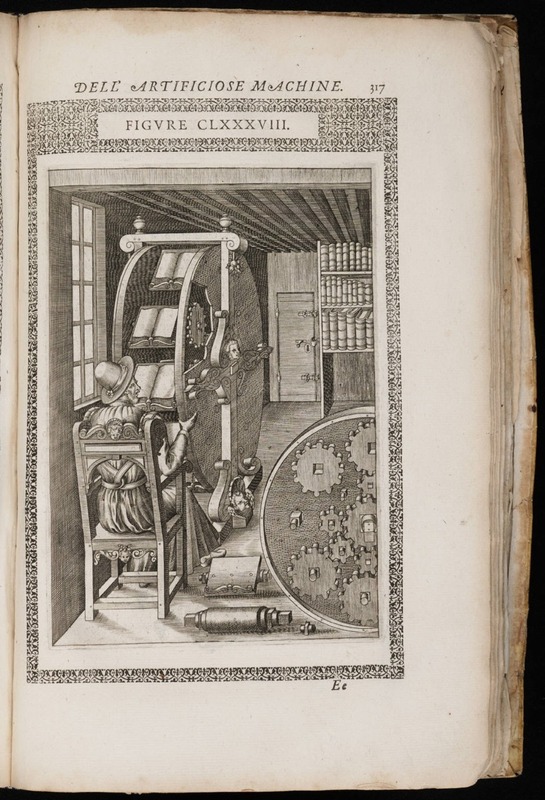 The image from 1588 shows the bookwheel invented by the Renaissance engineer Agostino Ramelli, whose concept was based on medieval designs. The upside to the carousel is obvious: there was space for a lot of books. This practice is not unlike deciding to hook up a second monitor to your computer, except that the individual is actually watching twelve monitors at the same time – like a trader on Wall Street. I have sat behind one from the 17th century myself and it is truly a majestic feeling to spin the wheel. The click-click sound of the gears hidden inside the device is simply mesmerising. While desktops (in their great variety) are representative of how most scribes and readers handled their books, there is also a surface space that is more exceptional – and that can only be addressed as a “laptop”. The use of such portable desks, which sat on the scribe’s lap, is well documented for the early-modern period (here is one from sixteenth-century Spain; here are a few others). They were used, for example, by noblemen or secretaries drafting documents and letters whilst on the road. It concerns a box with a slightly angled surface, inside which the writing materials were stored, including sheets, ink and pens. Interestingly, this practice – and tool – go back to at least the twelfth century, as Fig. 8 shows. The device contains a hole for the ink pot and inside may well have been blank sheets, in parallel to the portable kits from the Renaissance. Apart from the fact that the actual desk space was more limited than what we are used to, the medieval desktop was not so different from ours, including how messy it was. They contained books, both open and closed, as well as writing tools. However, more so than in our present time, desktops were a necessary tool, whether they were packed (as in Christine’s case) or with only one or two books in place (as with most scribes). The medieval quill, after all, needed a stable and even surface. While desktops may seem trivial objects to us, they were crucially important to both medieval scribes and readers. 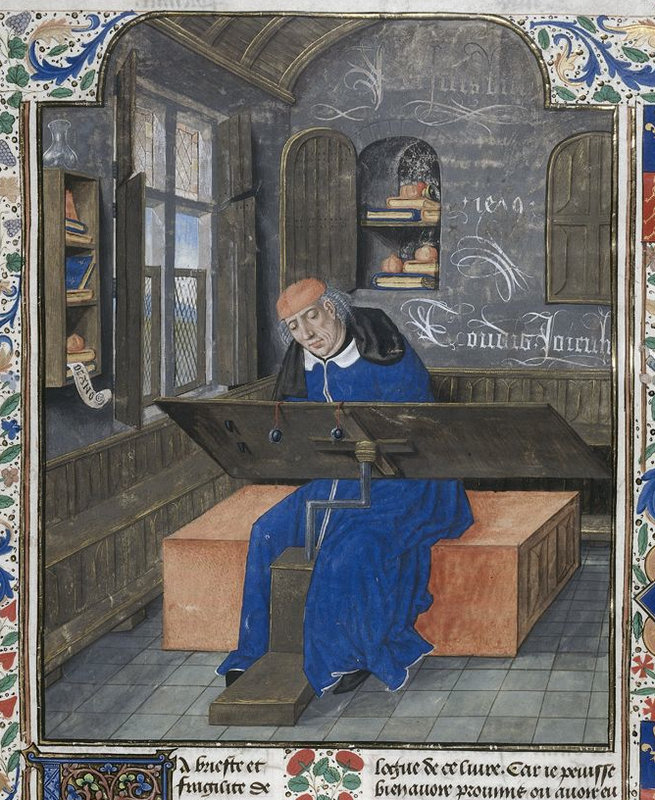 Note added 22 Dec, 2014: this image of the translator Jean Wauquelin at work (Valenciennes, BM, 772) also shows the translator sitting at two desks with a horizontal rather than a vertical orientation. It raises two questions: was this unusual set-up favoured by translators; and if so, could the reason be that it allowed them to point at the line they were translating, as seen in the Wauquelin image – after all, this would impossible to do with a vertical orientation. Loved this. Especially the wheel…I could use one of those. Right now its the dining room table with 5 books all open or bookmarked so heavily they’re like hedgehogs. Great stuff. Thanks. PS I keep wondering about Lindisfarne & Kells…the weather and the glassless openings (umm cf windows) and the short days and storms…HOW did they manage to produce what they did? Not a flicker of doubt in their perfect swirls. It blows my mind. I looked at the picture of the book wheel and said to myself that it was another of those wonderful illustrations of clever inventions that never actually saw the light of day… and then I read on. They do exist! but where? please tell! I’m also fascinated by the contraption between the man’s legs that appears to adjust the height or positioning of the desk! (Also Fig. 3.) A medieval standing desk? With horizontal orientation I mean two desks placed next to one another, rather than on top if one another (= vertical orientation). Hope that clears it up! I loved this post. That wheel looks magnificent; a Renaissance kindle! Great title! I am not a medievalist, but I was intrigued. Both the carousel and book wheel look very appealing. Reblogged this on House of Harnoeth. Thank you, Eric. Amazing pictures. I was long wondering where the slant of the desk comes from. Some say that this is simply ergonomics – more comfortable for arms and eyes. But in an article on inks, I read that the slant was dictated by the need to keep the goose pen at 90 degrees for the smooth ink flow. I believe the Chinese medieval scribal tables or Persian are not slanted. Any insight on this? When I read the title of your post, I wat excited thinking that this mystery will be finally solved for me 🙂 Many thanks for your blog. Unfortunately I have very little to say about this, in part because my knowledge about the “technicalities” of ink is limited. If a 90-degree angle is better for the flow, that would explain, perhaps, why scribes write on a nearly upright surface. On the other hand, the great variety in angle would suggest that both a (nearly) flat and a (nearly) upright writing surface worked fine. Not very helpful, I realise. And certainly not the last or best word on the matter. Interesting stuff, I’m lecturing (and writing) about information and content strategy at UWE and may use the picture of the book wheel – it’s fantastic. 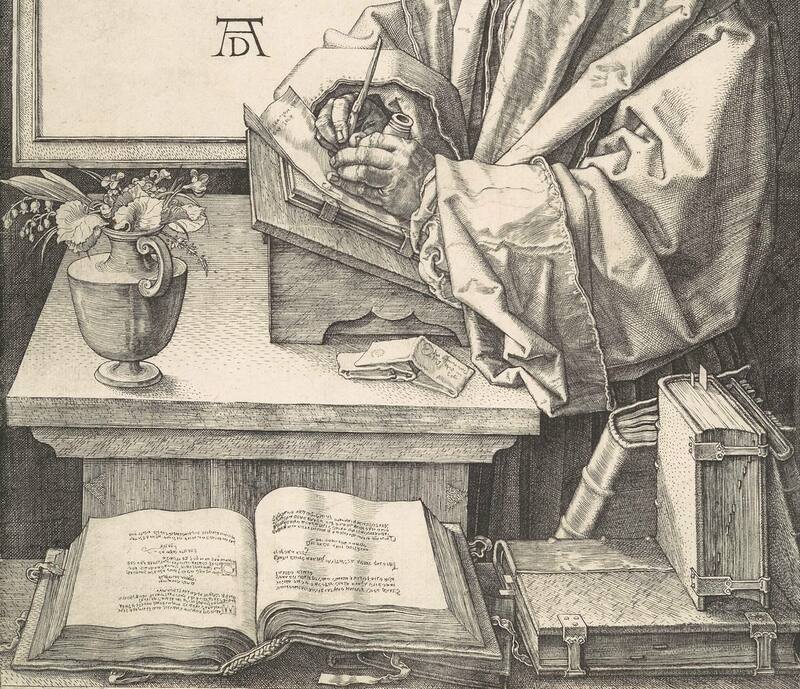 Also I have read that the Durer portrait of Erasmus is one of the first records of the use of the bookmark – you can see them sticking out of the volume bottom right. No idea where I read this or how accurate it is. Thanks for kind words in post. I? ?ve been visiting your blog web site temporarly now and i always appear for a gem inside your new posts. Thanks for sharing. As I’m typing this comment into my computer, both my laptop and my desk monitor are showing different programs. The metal stand I use to hold the writings on my yellow tablet I will copy to type is standing at my right,A set of referral books, coffee cup tile, book weight, camera, phone and numerous other notes and jottings make me glad my keyboard is at a lower level. Do you know the blog and website of Claudine Brunon, a calligrapher/historian with hands-on experience? (I see them on the MedArt-L listserve.) Just today, she posted about medieval scribes’ arm-chairs. And here’s a recent posting on recipes for green ink. Je vous propose de lire quelques formules d’une même recette d’encre vert-de-gris. Elle a ceci de particulier : elle utilise un contenant métallique cuivreux. Thanks for that information. 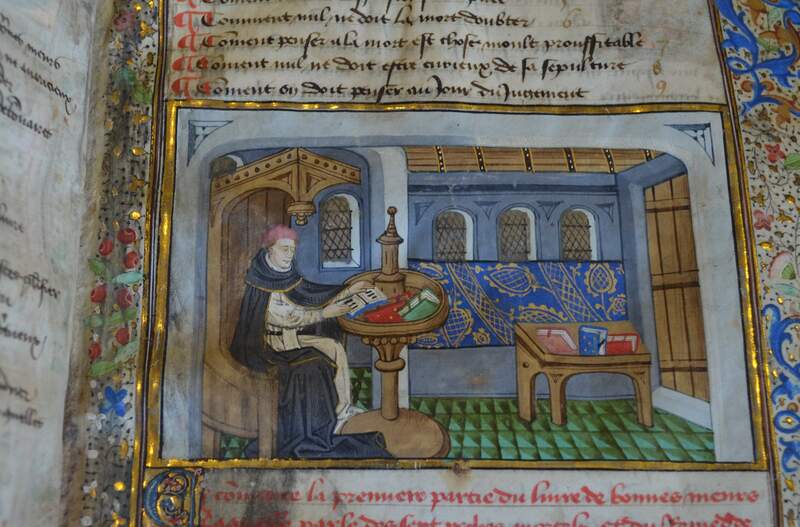 I did a little work on scribes’ desks (see this blog, “Medieval Desktops”).